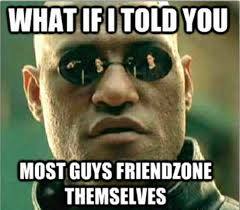 #Blogfest: The Morale Of The Friendzone! What is a friend-zone anyway? The Friend Zone is a sort of relationship limbo where one person is enamoured, smitten, lovesick, romantically attached with another person who would rather see them as a brother or sister and as such choose to remain friends than get attached too. Fundamentally, it’s one of the most dreaded places to be! It’s vastly populated with frustrated and love-challenged ones who would do anything to be awarded a green-light from the one they sold their love to. Yet, unfortunately, an astounding number of persons get thrown into this mysterious zone on a daily. C’est lavie ! For the friend-zoned, we’re not going to give you a moment of silence. It hurts, but it’s not the end of the world! We celebrate you instead because you stand a chance of scaling through this sad, ugly, funny-but-not-funny phase to a phase of managing and enjoying a more meaningful and loving relationship. Well unless of course you pass through this friend-zone without learning any lessons from it–then I’m sorry, you just might be on another endless journey of the zoned. The hardest part of being in the friend-zone is in accepting that for a fact you have been friend-zoned. You know, it’s hard to deal with the fact that Nkoli or Emeka that you would walk to the ends of the earth and back for have walked to the ends of the earth and back for is not in the least interested in you, and not just that, is probably seeing someone else over you because you’re “like a brother/sister” to her/him. Such reality hits like a brick that it becomes almost impossible to recover. But beating yourself over it will make it ten times harder to deal with. 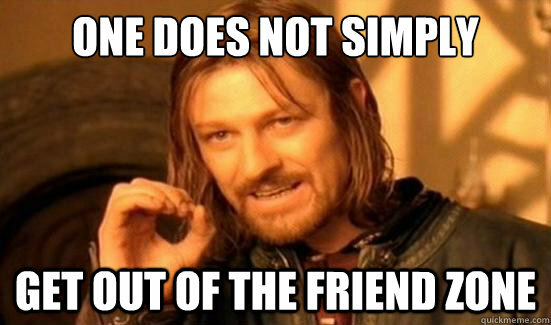 You’re neither the firsts nor the last to get friend-zoned. It’s much simpler to cover your head with a pillow and pretend that the day hasn’t begun but time passes and in the end, you gave to give up and face it. Quit rationalizing. Face your situation. Yes you have been friend-zoned. Deal with it! It’s lifeless in there but it’s up to you to get a life! The first step to dealing with your friend-zone status is in getting a life and not just a life–an actual life. The reason why you might have been kicked into the friend-zone is probably because you have helped him/her to live half their lives or given them a good measure of half your life. Ha! When you’re always your girlfriend/boyfriend’s friend’s first and last resort for heartbreak consolation, always a ready shoulder to cry on, always got a spread-out ear to listen, relationship adviser, always on that routine of leaving everything to drive off to their place and tend to their whims, rage and tears, always that all-weather-type-friend–and you feel something as good as next to love for this person, you will most definitely be friend-zoned! Yes, because all those “am-always-relevant” gestures will keep taking you one step further away from getting into the real picture with them. –Quit being remote-controlled because you want to prove to them that you got their heart better. The moment you make yourself less available is the minute they start wondering what you’re up to and who knows, they may be the ones falling for you instead! Basically, learn to live your own life and you’ll stop being an option in theirs. It might seem a dead zone- maybe ‘cause you’re dead–boring! As much as getting a life is very important in getting past the friend-zone phase, it’s also an opportunity to work on yourself. There’s no one such person who can’t do with a little bit of self-improvement. There are some attributes you might have or have not exhibited that have caused you to appear boring and hence, the friend-zone. For example, either failing to confess your true feelings towards them or imposing these feelings on them, both of which are just plain boring anyway! Acting a mum/dad, yet wanting a serious relationship will only place you in a position to be friend-zoned since it would be impossible to date one’s parent! On the other hand, just because you’re emotionally attracted to them don’t mean that they should feel the same way too! –Only a narcissist would think that way though. Be easy! No you’re not stuck, pull yourself out! The reason you got friend-zoned may not even be that you’re not good enough or attractive, sometimes it’s just a matter of sexual attraction and connection or absence of it. Rather than become a wimp, and moan all day about Nkechi seeing you as a “big bro” or Dayo relating to you as his “sister-in-Christ” but is relating with salewa as a sister-outside-christ when you obviously craving and sulking for a romantic relationship, use the “friend-zone” phase to recuperate! Yes, it did hurt and beginning another journey with your “friend-zone” baggage is indeed a tough one but you must move on. You can’t force or hurry love. Detach yourself from the friend-zone status and go where your worth can better be appreciated. The detachment stage is the best way to get out of the friend-zone fast. You must permit yourself a chance to breakaway and to feel something more genuine otherwise you might get forever stuck in your friend-zone. Promise. Once you succeed getting out of the zone either by some pounds of luck or love somehow came by from another lane, be sure to have learned your own share of the “friend-zone”. If you still haven’t, I guess that’s exactly what you want to do –Otherwise, be sure to thrown back into the friend-zone hole in no time! Hahaha! This is funny, yet very practical.